Pop art is a movement that emerged in the mid-to-late-1950’s in Britain and America. Commonly associated with artists such as Andy Warhol, Roy Lichtenstein and Jasper Jones, pop art draws its inspiration from popular and commercial culture such as advertising, pop music, movies and the media. The Pop Art movement adopted commercial methods like silk screening and the reproduction of existing works, downplaying the artist’s hand and subverting the idea of originality. In extreme contrast to Abstract Expressionism, the intense and highly expressive movement that had dominated the post-war art scene, Pop artists were emotionally detached and injected irony and wit into their paintings. Photorealism evolved from the Pop Art movement in the late 1960s – like pop artists, photorealists were inspired by everyday objects, scenes of commercial life and modern-day consumerism. Photorealism sought to convey real life with minute finesse. Artists like Chuck Close or Duane Hanson began to paint pictures using photography as a source, aiming to render a more evocative reality. Hyperrealism is often considered an advancement of Photorealism and came to prominence at the turn of the millennium. 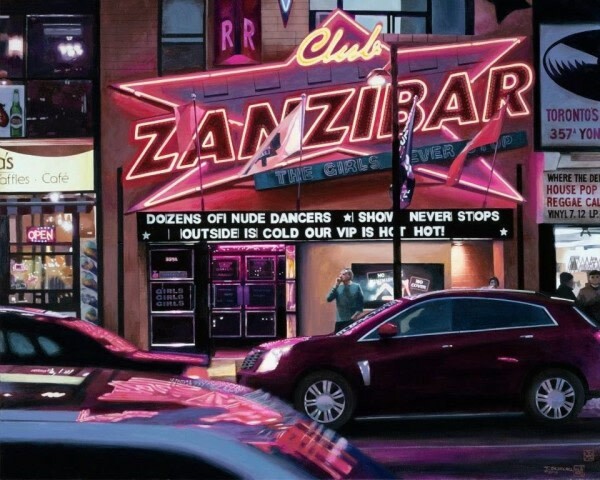 Where Photorealism aims to imitate a photograph with precise and sharp technique, Hyperrealism, though photographic in essence, places a more complex focus on the subject depicted. This allows artists, unlike in Photorealism and Pop Art, to include expression and narrative in their works. 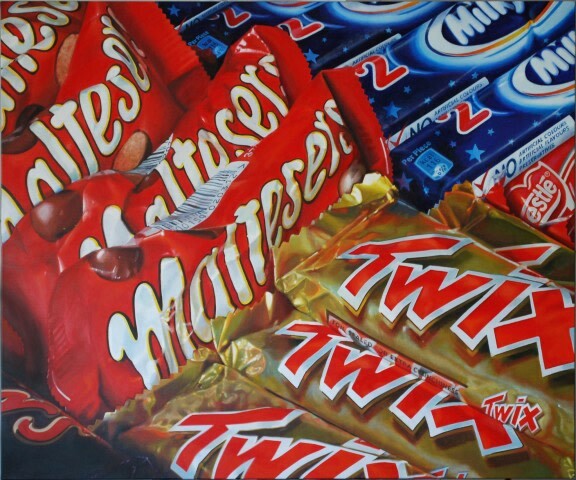 The work of British hyperrealist Mike Francis is heavily influenced by the Pop Art movement. Francis worked as a commercial illustrator for many years and this is clear to see through his work. His paintings combine illustrative and hyperrealistic techniques which echo the style of 1950s postcards. 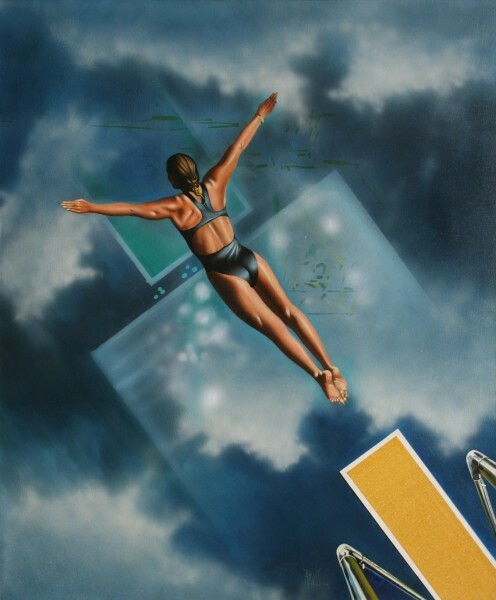 Francis has also created several large scale pool scenes that bare a resemblance to the iconic poolside paintings of British Pop artist David Hockney. Hockney first began painting aquatic scenes during his first trip to Los Angeles in 1964, rendering vibrant swimming pools and the Californian modernist architecture surrounding it. Similarly, Francis’s poolside compositions possess a distinctive summer feel and remain vibrant in both colour and narrative. His paintings also include architectural elements and often feature bikini-clad females accompanied by a dog. 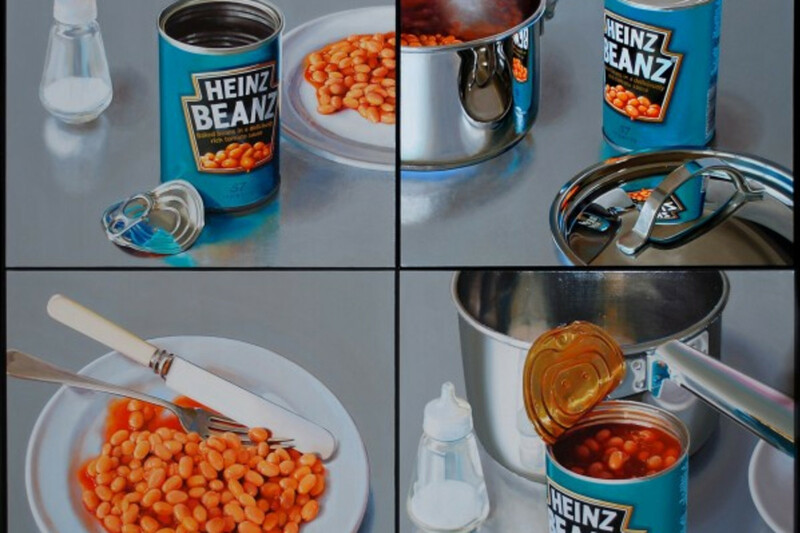 Cynthia Poole’s paintings also take branded items as their subject; popular objects include mass-produced confectionary, lifestyle and fashion magazines and cans of Heinz Baked Beans (a play on Warhol’s soup cans perhaps?). Poole paints each individual item with meticulous detail. Her hyperrealist approach draws even more attention to the paintings and their popularity is not only on the grounds of the familiarity felt when faced with such objects. Poole’s paintings combine handmade and readymade or mass-produced elements, creating a kind of glorious confused landscape; the combination of objects, images, and sometimes text not only make new meanings but evoke an overwhelming feeling of nostalgia that can arise from such objects. Ed Ruscha was an influential artist of the Los Angeles Pop Art movement. Full of artifice and superficial appearance, LA was a consumerist wonderland full of commercial signage, fantastical buildings and facades available at the Pop artist's fingertips. 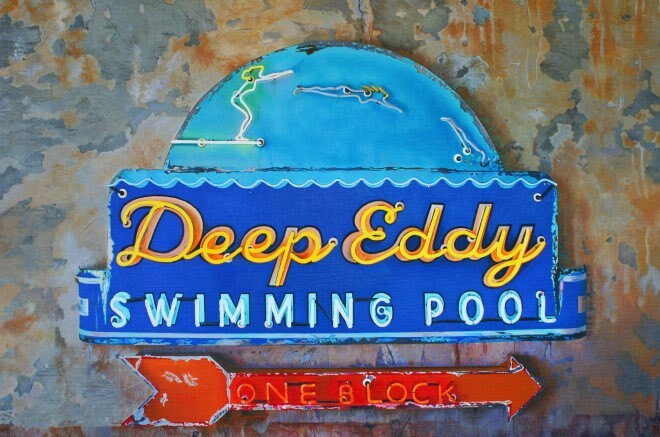 The use of signage in Pop Art has continued to be an important feature of contemporary art, particularly in Hyperrealism, where artists such as Tad Suzuki, Carlos Marijuan, Gus Heinze and Denis Ryan all produce paintings of shop fronts, diners and neon signs for example.